Though the Holocaust only wiped out a half-million of Europe’s gypsies — a fraction of the six million or so killed Jews — it did do away with a higher percentage of the Roma, nomads who migrated west from northern India more than 1,000 years ago. This brilliant documentary explores that forgotten saga, their fascinating past, and their still struggling present. Director Aaron Yeger recently answered a few of my questions via email. The story first came out of a conversation between executive producer Lenny Binder, producer Tom Rasky, and musician Robi Botos. 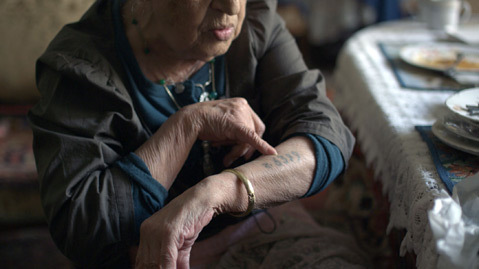 Binder and Rasky, both Jewish and children of Holocaust survivors, were intrigued to learn that Botos, who is Roma, had also lost family in the Holocaust. The duo decided to produce their first documentary to spread the little-known story of the Roma’s fate in the Holocaust (or Porrajmos as it is sometimes called in reference to the Romani people). At the time I was working with producer Marc Swenker and director of photography Stephen Whitehead. Tom Rasky is my cousin, and we all came together as a group to make this documentary, which is one of those rare instances of uncovering an incredibly important story that just absolutely needed to be told. Marc, Stephen, and I are eternally grateful for having been granted the opportunity to work on this film. Are any of you Roma? Robi Botos is the sole member of the production team who is Roma, and in addition to inspiring Tom Rasky and Lenny Binder to make this film, he composed the score and plays the piano in it as well. He is remarkably talented. I don’t have a personal connection to the Romani experience, but I do have a connection to the Holocaust, as both of my paternal grandparents are Holocaust survivors, and other members of my family were lost. The Jewish Holocaust survivor in the film who recounts observing Roma forcibly taken away to the death camps is my grandfather. Why have these people been unable or unwilling to assimilate after 1000-plus years? There are two important aspects to consider here. One is that racism and marginalization can be a self-fulfilling prophesy. The Roma were always treated as outsiders in Europe, as they don’t have a nation state to represent them. The more people are pushed to the margins of society, the less they trust other members of the society and authorities, and vice versa. Prejudice thus becomes a cycle, or feedback loop that is very hard to break, and other groups have faced the same type of prejudice and situation. In the film we show comparisons with both Jews and African-Americans in this regard. Another important part of the equation, as described by Dr. Petrova and Dr. Chalk in the film, is that there is sadly a tendency for societies to scapegoat a group or select a group to be the outcasts so that the majority population can feel superior by comparison. This tendency is at the core of racism itself, and the Roma are not unique in this regard in being targeted by these attitudes, however they have been pushed into that place in society in many countries. What’s the status of today’s Roma? It should be noted that the Roma are a diverse group of people and generalizations about their status can be problematic. That said, racist attitudes and outright persecution and attacks against Roma is increasing in Europe, and this is probably at least in part due to the economic crisis going on right now. The fact that the Holocaust began during the Great Depression is no coincidence. A People Uncounted screens on Sunday, January 29, 1 p.m., at the S.B. Museum of Art and again on Thursday, February 2, 10:20 a.m., at the Metro 4.